Abscessed teeth, a broken tooth, or a bleeding mouth wound are all good reasons to find an emergency dentist near you as soon as possible. Michael Moawad, DMD, at Dental Arts of Edgewater is ready to serve the emergency dental needs of your entire family. If you or a family member are facing a dental emergency, call the office in Edgewater, New Jersey, or book an appointment online. Emergency dentists like Dr. Moawad treat oral injuries and pain that need to be fixed or addressed immediately. Emergency dental situations usually involve saving knocked-out or broken teeth. Coming into Dental Arts of Edgewater within 30 minutes of your tooth or mouth injury could mean the difference between saving or losing the tooth. If a tooth is slightly chipped and doesn't hurt, though, you might not be dealing with a dental emergency. That said, feel free to contact Dr. Moawad at Dental Arts of Edgewater if you're concerned. He can explain how to take care of your tooth until you can make it into the office. Quick action is imperative for a dental emergency like a knocked-out tooth. If you don’t receive immediate dental care, there's a good chance you'll lose the tooth for good. To try and save the tooth, start by cleaning the injured tooth and the inside of your mouth. Rinse your mouth and tooth with warm water, being careful not to touch the tooth by the roots. Hold the tooth by the crown (the smooth white top part) as you rinse it. If you can, hold the cleaned tooth by the crown and reinsert it into the empty socket. Close your mouth and bite down gently on the tooth, if you can. It might help to bite down on a soft piece of gauze until you can visit Dental Arts of Edgewater. Call the office right away. Or, have a family member or friend call to let the staff know you're on your way. If the tooth can't be replaced in the empty socket, place it in a small cup of cold milk. The milk will help preserve the roots until you can make it into the office. 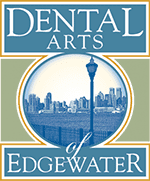 In the event of a dental emergency, call Dental Arts of Edgewater for expert assistance.